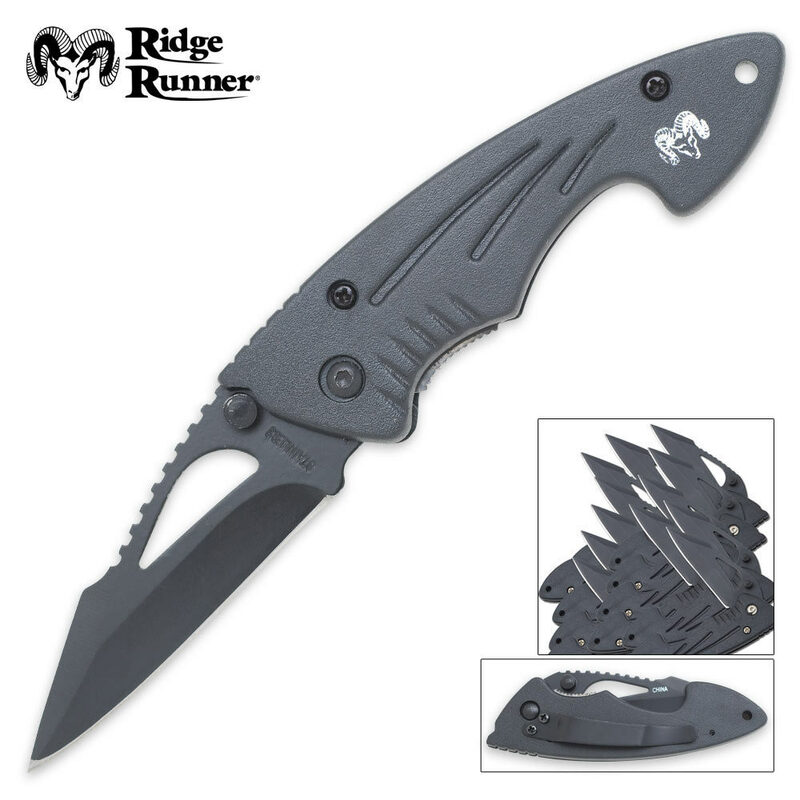 12 Pack Ridge Runner Tactical Pocket Knives | BUDK.com - Knives & Swords At The Lowest Prices! Own at 12 pack of these tactcial folding pocket knives for a better-than-wholesale price! 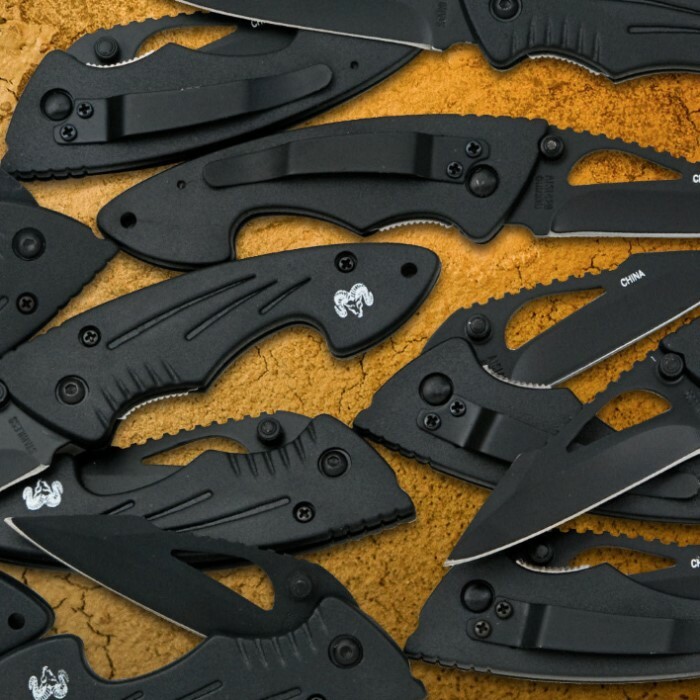 That's right-12 tactical folding pocket knives at a rock bottom price you won't find anywhere else. I purchased the knives to give to my fellow vol. firemen. I have used mine for over a year now. I tested 24 of them and found 13 of them not locking open. I took a round file and filed down the notch on the handle where the blade's thumb piece was hitting till the blade would lock open. Not hard to do. The blades are sharp and easy to resharpen. Light and easy to carry. Great buy for the money. I had purchased these to give as x-mass gifts ,and when i opened the box i found the screws holding the pocket clip on were rusted . all of them . the blade locking mechanism on all but 2 don't work . i can fix the rust ,but the frames on these knifes are plastic , i can't fix that . this is the first disappointing purchase from budk . these knifes are not a good buy . Great little set of 12 knives! I've given these out to my co-workers and they all love them! Great for opening boxes and they are sharp right out of the box! Hold an edge for a good while too! Best knife deal I've seen in awhile! Will be picking up another set very soon! I just opened the box delivered today . Every one of the knives were in great shape and to my surprise very sharp. Great deal for the price . Get some while they are in stock. These knives are great for teaching a "Whittling Chip" class to Cub Scouts with a small investment and the blades lock. Don't let the picture confuse you. You don't have to assemble them. Was reluctant to buy 12 knives for such a reasonable price and thought I would get 12 pieces of s%#t but was very surprised at the quality of these knives. All 12 were in good and tight working order. Have been passing out to buddies that all like them. I bought this set as a small investment. I thought it was a very good steal deal. But it turns out, five knives out of twelve were defective. I returned these soon after. This is a great gift to give.. kinda. The knives have finger groves that don't fit anyone that I knows hand. They are big for a pocket knife, but flip open easily. As you've likely noticed $20 for 12 knives is a great price. However these knives aren't very heavy duty quality, and though they may be "impact resistant" they wouldn't deal well if they were hit with a hammer. On a good note the blade sharpens pretty easily and seems to hold a decent edge. The knives also come in a display box with a molded area for each knife. If you want to give away a decent knife or resell them then you can't go wrong.